In this revealing book, author Jon Gauger presents interviews with over two dozen respected Christian leaders, including Ravi Zacharias, Michael W Smith, Tim Keller, and Joni Eareckson Tada. Each shares candidly their triumphs and failures through the lens of God's redemptive grace. About "If I Could Do It All Over Again"
We've all thought about it at some point: What if we could go back in time and do it all over again? If there were a way, we each have decisions we would change, regrets we would erase, and mistakes we would undo. 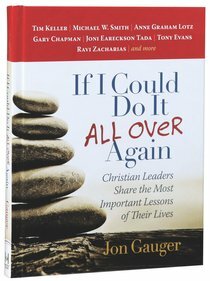 If I Could Do It All Over Again explores the concept of a "do-over" through insightful and vulnerable interviews with more than two dozen respected Christian leaders, including Anne Graham Lotz, Ravi Zacharias, and Michael W. Smith. Like an intimate conversation over a cup of coffee, these leaders transparently share stories of their struggles, triumphs, and failures through the lens of God's grace and redemption. While none of us will get a "do-over," we can find biblical hope and encouragement through the stories of others. In this thoughtful, raw, and contemplative book, author Jon Gauger asked the hard questions and has compiled wisdom sure to leave you filled with hope, courage, and freedom. Jon Gauger is a cohost of two nationally distributed weekly radio programs and an award-winning narrator of more than 35 audio books. He is an ordained minister and seasoned communicator who has taught nationally and internationally. He and his wife, Diana, are the parents of two adult children. Customer Reviews For "If I Could Do It All Over Again"
Easy to read in short snatches and challenging, I am sure that there is something here to encourage every person who reads it. I would give it to people of any age unhesitatingly.